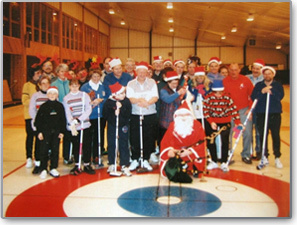 Balfron Curling Club was instituted and admitted to membership of the Royal Caledonian Curling Club in 1867 when there were 17 regular playing members, eight occasional members and four honorary members. The first president was William Neilson with John Brown, Archibald Simpson and Andrew McLay as office bearers. The club had a chaplain the Rev. Alex Niven, minister of Balfron Church for 47 years. The patron was Archibald Orr Ewing of Ballikinrain, a prominent businessman and M.P. founder of a major Turkey Red dye works in the Vale of Leven. Unfortunately there are few surviving records and although it is not known when curling was first played in the village it was well enough established by 1865 for a curling pond to be marked on the first series of Ordinance Survey maps. 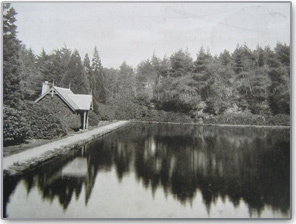 There were also other ponds in the area with two at Ballikinrain where ‘the rocky sides were covered in Rhododendrons and a curling-stone house stood on the bank of the lower pond’. Balfron’s pond was on Ballindalloch Muir, however it was not in a pleasant situation being exposed to strong east and north winds. The club was disbanded for several years during the Second World War but in 1947 the pond was cleared out and continued to be used in cold weather. There are still those in the village who remember as children skating on the pond in the moonlight much to the annoyance of some curlers. The club was reconstituted in 1947 with 35 members, all men, many of whom were descendants of the original founders. At that time matches were played at Crossmyloof in Glasgow and by the time women members were admitted in the early 1970s games were also played at Falkirk where 2 ½ hours curling cost 2/6d (12 / ½ p). Stirling ice rink opened in 1980 and later Forest Hills by Loch Ard was more widely used. Today we enjoy excellent facilities at The Peak, Stirling. Balfron Cup is the club’s oldest trophy dating from 1883. It was presented by James Edmond. Machar Cup was presented by Jim and Margaret Pirie in 1978, so that the club would have two cups to play for. It is named after the Machar Burn that ran through their farm. Simpson Quaich was gifted in 1991 by Sandy Simpson in memory of his father, Tom Simpson, one of the founder members of the reconstituted club in 1947. Dunmore Trophy is awarded annually to the individual who scores highest for attendance and competition performance. It was presented by Roger and Barbara Sparkes in 1995. Neil McIlduff pairs trophy was first played for in 1982, in memory of Neil, a Balfron curler, who died tragically young on the ice at Crossmyloof. 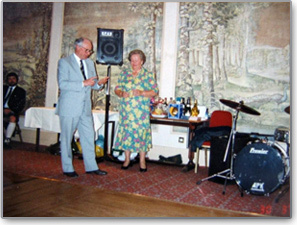 Opening Bonspiel Salver was presented in 1991 by Helen Stringer to mark the sponsorship of Balfron’s local newsagent.